I was 7. He was 47. I was free. He was jailed. It was 1977, my first political rally in home town Muzaffarpur. And I was rallying behind George – George Fernandes. My father, a Congressman, due to some serious differences with Congress leadership, was supporting George and was the brain behind the famous poster in which the firebrand socialist leader was shown holding up his handcuffed hands from behind the prison bars. It was election time and the poster became an instant hit, penetrating deep into voters’ mind. The idea set people into motion. People also liked my father’s idea of a moving truck with a vivid description of the jailed leader. In Muzaffarpur, George was little known. But my father and George’s socialist ideas made the difference. And though an innocent kid, I was moved by George’s handcuffed images. On Sundays and holidays, I would follow the electioneering truck carrying George’s posters and would join people at cross-roads in shouting: “Jail ka phaatak tootega, George Fernandes chhootega” (prison gates will break and George Fernandes will be free). One evening, I had unexpected visitors in my house – George’s wife and mother. That night itself, George’s then lawyer Sushma Swaraj also came to address a late night rally in my town which was to serve as his constituency. It was a massive rally. Equally plotting was Swaraj’s speech. And before she spoke, I jumped to the dais when my sister recited a patriotic song amid round of applause. Such an excitement at such a tender age. The letter George wrote to me. Click to enlarge. When I met George as an adult, I never told him all these. I thought my family’s contributions were too small in his long journey. Also, I was afraid if he would recall such little gestures. He gave me a patient hearing exactly five years ago when I went to discuss the trade union situation in my company Press Trust of India (PTI). He was convinced. Immediately, he raised the issue in Parliament. 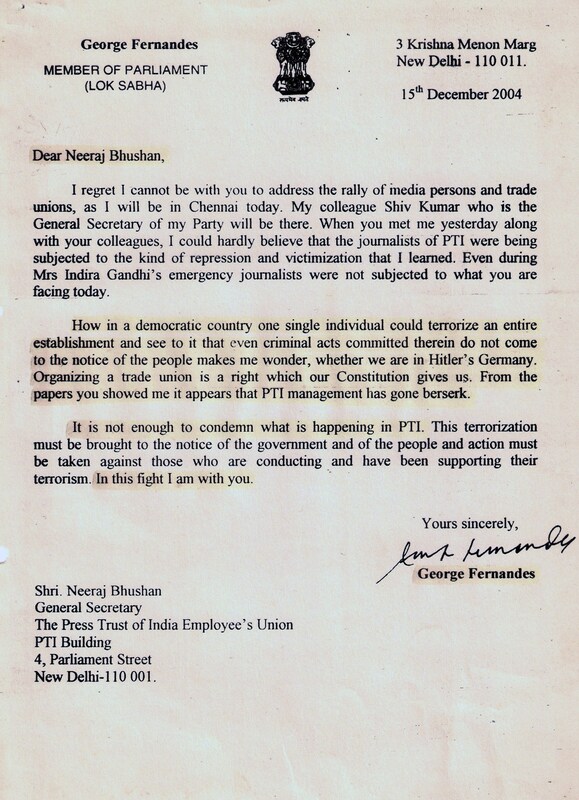 Then, he also petitioned the Indian Legislature, narrating the situation in India’s premier media company – PTI. And when he could not attend one of my rallies in New Delhi, he did not forget to send me a letter. Oh George! I’m grateful. As a journalist, I am not expected to subscribe to any political party or sing for a politician. But my heart beats for every honest person who is in politics – be it George Fernandes or Manmohan Singh. Today, I am sad over the fact that some people are trying to exploit the dire situation George is in. His condition is as dilapidated as his New Delhi’s Krishna Menon Marg house. I had chosen to remain silent when my hometown Muzaffarpur wrote George’s political obituary during 2009 parliamentary elections. I kept quiet when George baiters planted stories in the media that he had huge money and that his wife, son and brother were coming back to him, after decades, primarily for money. I did not speak when George’s long-time associate Jaya Jaitley was accused of eying his millions! My best source tells me that just few months back George had visited top lawyer Fali S. Nariman to request him to draft papers related to his assets. George wanted his worldly goods to be shared between his son and some social causes. But the draft could not be finalized owing to his son’s lack of interest in his possessions. This revelation and absurd plants in the media have pained me. I find that there is a filthy move by some vested interests to wipe out the socialist image of George from people’s mind. They want to paint George, his family and Jaya black. The dispute over George’s property is unnecessary and reckless. Mindless. Today, I’m 40. He is 80. I am young. He is old. I’m kicking and chirpy. He is recuperating and cheerless. It is frustrating, though, to learn that George is being kept in isolation. He’s a peoples’ man. Much ahead of his death, please do not put him in dirty coffin. I want him back. I am one of the few people who had the good luck to work for such a great man from 1990 to 1998, even as he was the Defence Minister, when I finally left his employ. I currently live and work in USA, but think of this great man and his simplicity, honesty and integrity all along the years I have known him, every single day. I cried when the Tehelka scandal broke out and his name was dragged into the mud. I have personally known his simplicity and availability to every one who walked through his door – I had the unenviable task of stopping too many people from taking his time and preventing from reaching his South Block office. 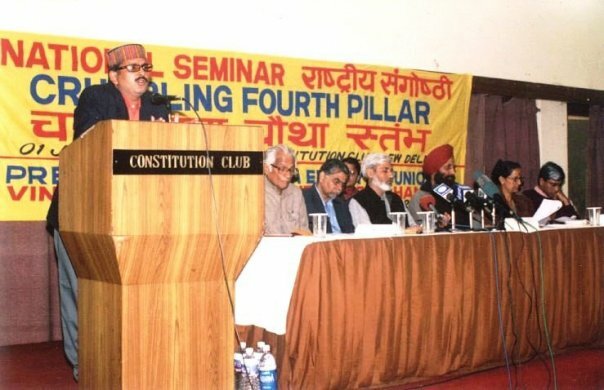 He washed his own clothes, rode in my Bajaj scooter to Parliament, did not have an ego – if you knew him personally his outburts were only when injustice happened. What a great man!! I had sincerely hoped to see him in Parliament for a long time and his mental acumen. I have so much information and pleasant experiences during my brief stint of working for him that would fill a book. Happy 8oth Birthday George Saab!! So happy to hear Ramesh. Nice comment. THE FIGHT over the multicrore property of former defence minister George Fernandes has taken a new turn. His brothers now demand it be used for the welfare of the poor by creating a trust, “ as wished” by the ailing leader. The brothers extended their support to the ailing leader’s long- time aide and companion Jaya Jaitly on the grounds that “ her contribution to his life can’t be ignored”. The brothers — Michael, Aloysius and Richard — were careful in their selection of words over the controversy. “ George always wanted the proceeds from the sale of his property ( in Nelamangala near Bangalore) to be used for the welfare of the poor. All plans were made only after consulting him. Now, a complaint filed by his son has put an end to his dreams,” one of them said on Saturday. Claiming that the Janata Dal ( United) leader had plans to develop a study and research centre on one of his property, Michael said: “ Unfortunately, his health began to fail. It was decided we would set up a foundation in his name. He had agreed to this during his medical check- up at Toronto. We even prepared a list of beneficiaries who were to receive endowments and grants from the foundation”. Taking a dig at Fernandes’s wife Laila Kabir and son Sean, who have laid claim to the leader’s property, the brothers said the two “ surfaced suddenly” after distancing themselves from the politician for 25 years. “ During those critical years, George continued to evolve as a public figure. Now, all of a sudden, the family is denying us access to George. This is not fair,” they said. The brothers, though, would not seek any legal recourse. “ We are looking for an amicable solution. We hope the trust is allowed to perform its duties in accordance with George’s wishes,” they said.